A Control Component allows you to convert drawings between DXF and DWG, and AutoCAD file version conversions, no AutoCAD required. Support DWG and DXF in versions from R9 to 2018. This full featured DWG DXF Control Component is a completely standalone utility, don't require any products from AutoDesk to use this converter. This control allows you to convert between DWG and DXF as you wish without AutoCAD. And you may change versions of DWG and DXF both from low to high and high to low between AutoCAD R9 and AutoCAD 2014. 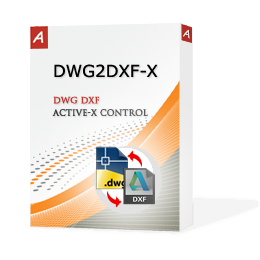 The latest version of this DWG DXF Converter ActiveX Control 2018 has been released recently. You must run "regsvr32 ActiveConverter.dll" to register the control first. The DWG DXF Control Component is licensed as DEVELOPER LICENSE, SERVER LICENSE and SITE LICENSE. DWG DXF Control Component lets you to convert DWG to DXF, DXF to DWG and file version conversion. Please go to the program folder and double click the file reg.bat to register the ActiveConverter.dll or ActiveConverter64.dll on your system. If you run Win7/Win10 and the reg.bat file won't work, please click start button>>All programs>>Accessories, then find the "Command Prompt" and right click it to choose "Run as Administrator" option to open the command prompt window, then try to use the command regsvr32 to register the ActiveConverter.dll or ActiveConverter64.dll. Prior try out the Control Component program with your own application, please try to give it a very first test with the example code enclosed within the free trial package, please make sure it will work as expected and then try out with your own program. Notice: This program does NOT convert AutoCAD R9, R10 and R11 versions from DXF to DWG, which are Autodesk releases earlier in year 1990. The input file name that you want converte to.